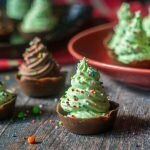 These tasty chocolate Christmas tree mousse cups are a breeze to make with only 4 ingredients and will be a festive touch for the holiday celebrations. I also have a low carb version that you will love too. You might like these low carb holiday cranberry & pistachio biscotti too! When I think of the holidays I think of candy, cookies and Christmas bark. I like to make some sweets for the holidays but I’m not much of a baker so I usually make something simple. After all I’m the one who does all the shopping and planning so I may as well make it easier if I can. 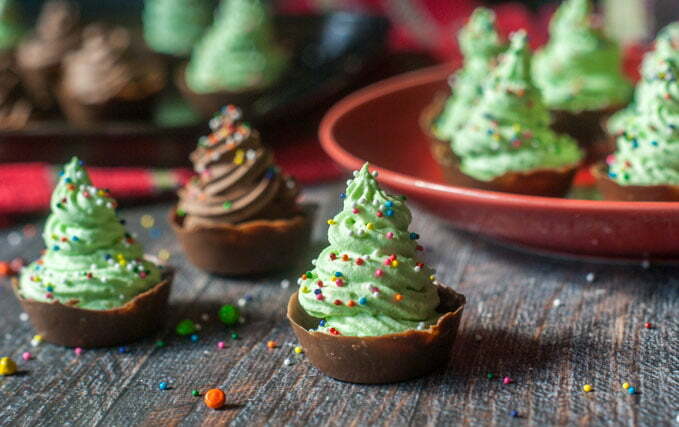 These chocolate Christmas tree mousse cups are the epitome of easy. My son loved them and my father in law really liked the low carb version because he’s diabetic. A have a special treat for you today. 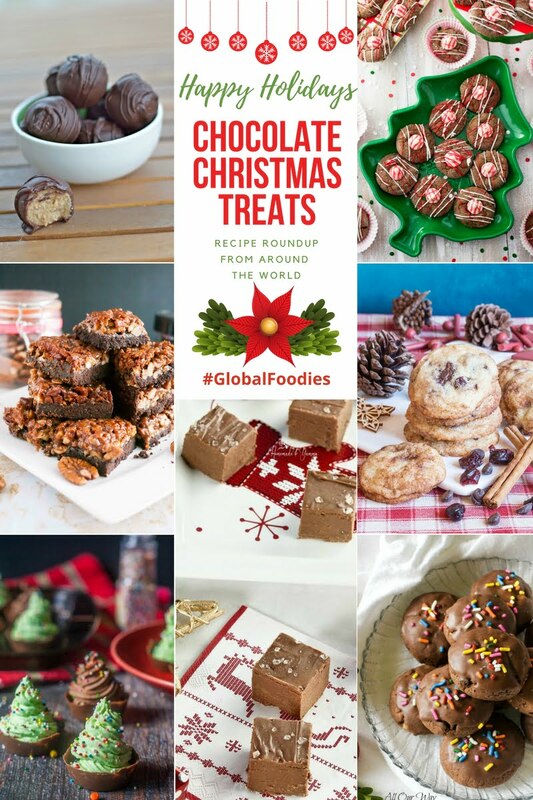 Some of my blogging friends from #GlobalFoodies are joining me with their chocolate Christmas treats. They have some lovely ideas so check out the links to their recipes right under this graphic. These would be great for your cookie swap or to have on hand for holiday guests. These are very simple and the four ingredients are heavy whipping cream, instant pudding, almond milk and chocolate bark. Let’s start with the cups. I bought some milk chocolate bark from Aldi. It comes in 2 oz cubes that you can easily melt in the microwave. Then you paint it into a mini muffin pan and set in the freezer for about 5 minutes to harden. I use a silicone muffin pan like this because it’s easier to get them out but a regular mini muffin pan will also work. Now you have your chocolate cups. To make the chocolate mousse trees I used a box of chocolate instant pudding, heavy whipping cream and almond milk. You whip them up in your mixer until it is a creamy but stiff like a mousse. 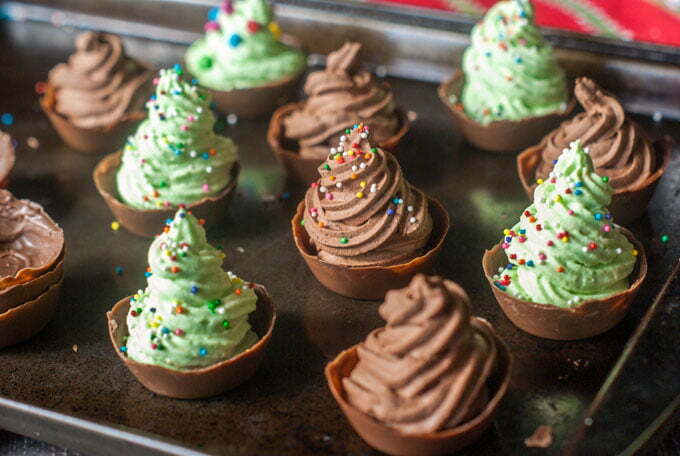 Next spoon the mousse into a icing bag or you can even us a zip lock bag and pipe the trees into the chocolate cups. For the green trees I use food coloring and vanilla pudding. You can also add some extracts (like peppermint) or try different pudding flavors to get the combination you want. Heat 4 tablespoons of coconut oil, 2 tablespoons of cocoa and 2 tablespoons of sweetener. Pour into a mini muffin pan and freeze for 5 minutes. Meanwhile mix 1 1/2 cups of cream with a small box of sugar free jello and whip until stiff. Spoon into an icing bag and pipe onto chocolate coconut disks. 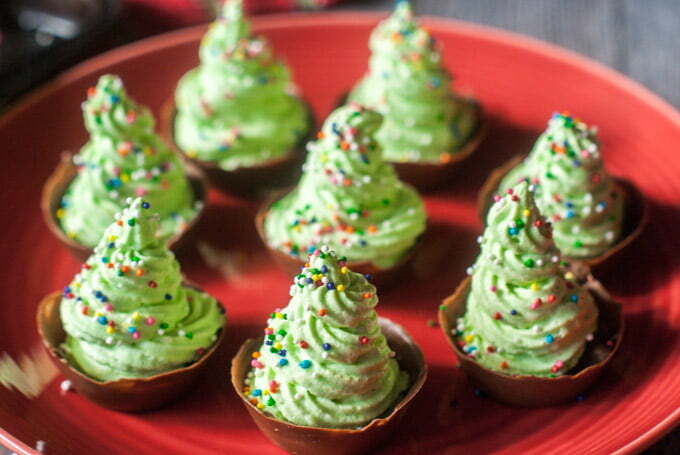 Well I hope you like these simple Christmas tree mousse cups. 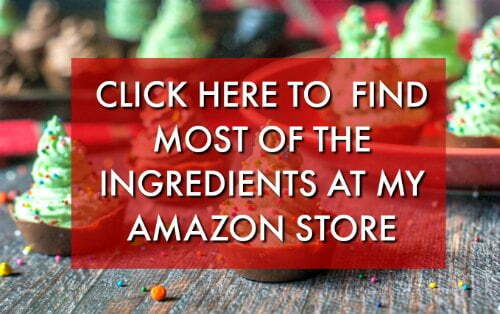 Please check out my friends wonderful recipes above and I think you will be set for the holidays! Melt chocolate in the microwave for about 1 minutes. Even if there is a few chunks unmelted, once you mix it, it should all be melted. Don't over cook. Taking a simple arts and crafts type paintbrush paint the chocolate into the mini muffin tins and set in the freezer for 5 minutes to harden.You may have to do this 2 - 3 times to get a sturdy cup. Meanwhile add the almond milk, cream and pudding to a mixer and blend on high for about 3-5 minutes or until a thick, stiff mousse is made. Spoon into an icing bag and pipe into the chocolate cups. Decorate with sprinkles if you wish. Previous Post: « Santa’s Little Helper Spiked Low Carb Cocoa – with or without alcohol! These are so very cute, and so effective. Such a lovely idea for an alternative to heavy Christmas pudding. They are light and sweet! Those are absolutely adorable! I love this idea. One question – almond milk for flavor? To add extra body? Just to make the recipe stretch a little further with out add more cream. It’s not necessary to the recipe though. I just can’t believe how adorable the Christmas cups are!! I’d love to make some. This treat is the type that kids and grownups would love! I love mousse and instead of being a heavy dessert it looks as light as a feather. Thanks Marisa! It was pretty light but just right after a big meal. These are SUPER adorable Denise! And I cannot believe how easy they are to make! These will definitely make an appearance on one of the parties we’re hosting. Thank you Jolina! They were a lot of fun to make. I can’t wait to experiment with different flavors. These are so cute. My grandkids would love eating these for sure. I love that you can make them in different colours.. Very festive. My son really liked them! 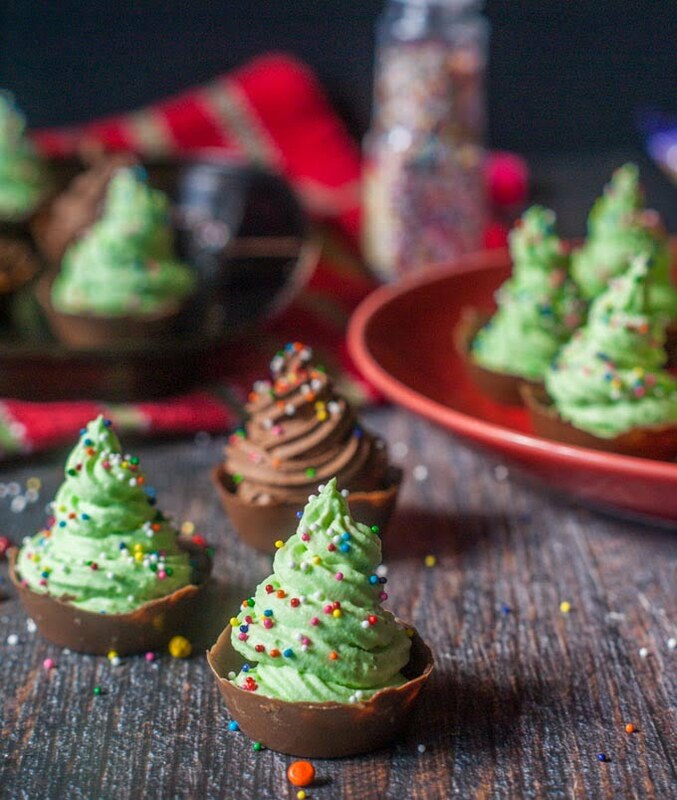 I love these Christmas treats because they are so cute and so easy to make! Okay, these are maybe the cutest stinkin’ things I’ve ever seen. Like, ever. AND they’re chocolatey, moussey deliciousness. Can you say perfection!? 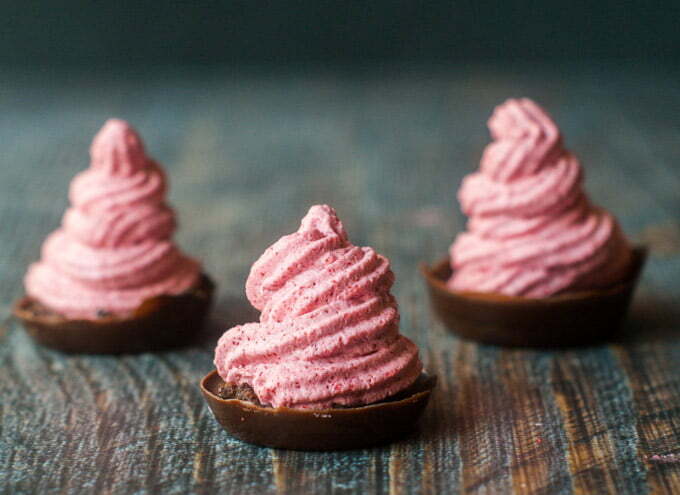 I love mousse and these are so cute like little Christmas trees. I think a chocolate Christmas mousse tree would make a perfect Christmas dinner desserts. I love such cute stuff. Thank you Veena, they were simple but fun. I think next time I will experiment with different flavors.